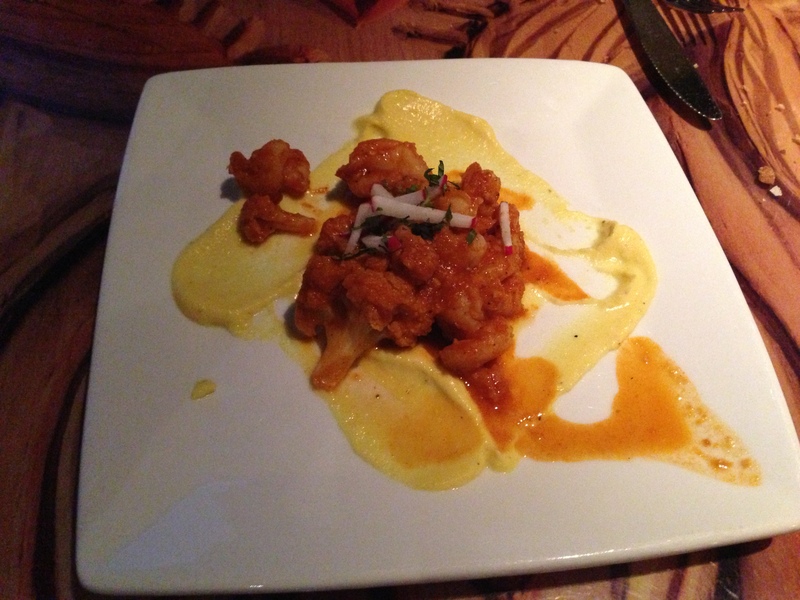 Dining Recon: Sanaa | It's "All in WDW"
… Christmas, and it was magnificent. Joined by Mrs. All in WDW and our son, the three of us have raved about that meal ever since. In fact, Mrs. All in WDW and I went back for lunch a few weeks later – where I was made Mayor of Sanaa on FourSquare! I have now lost that honorable distinction, but their “African cuisine with Indian flavors” sticks with me to this day. Well, at this point, there’s no reason to write a second ‘Advanced Scouting Report’, so I think it’s best to just dive into the food and present “Dining Recon: Sanaa”. Enjoy the pictures, my friends. We surely enjoyed the cuisine! If you have to wait for the restaurant to open, like we did, or if you just have to wait for your table, you can check out the menu on the wall. Page 1 – Click on the picture to see a blown-up shot. 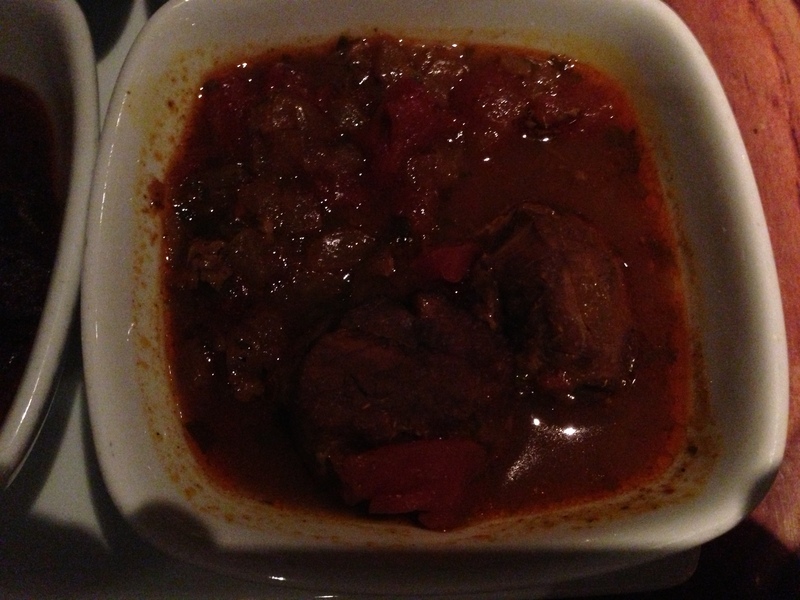 African Cooking with Indian Flavors! As you walk into the restaurant, look immediately to your left to see the bar tucked into a nice cozy spot adjacent to the main dining area. In my opinion, the most striking things about Sanaa’s decor is the wood, the shapes and the colors. See? We were seated at a table next to the window. How can you argue with that when one of these guys can be seen sauntering across the grass? If it was too hard to read the wall menu, take a look at these pics of the table menu. If you read my ‘advanced scouting report’, you know that we were aiming to start off with a solid dose of Sanaa’s Indian Style Bread Service. Well, we did. For our five bread selections, we chose two helpings of Naan and one piece, each, of Garlic Ginger Naan, Spiced Naan, and Onion Kulcha. 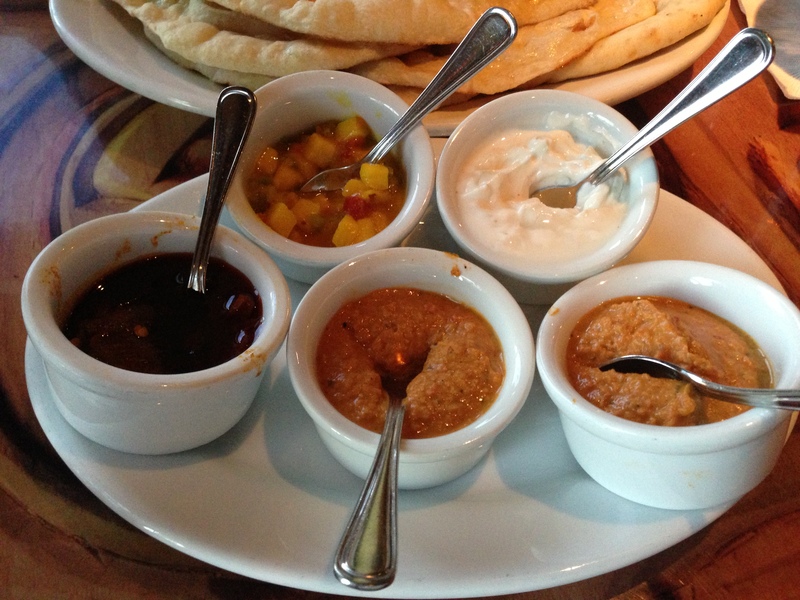 For our accompaniments, we selected two portions of Roasted Red Bell Pepper Hummus, the Cucumber Raita, the Mango Chutney, and the Spicy Jalapeno-Lime Pickle. The bread was fresh and simply outstanding. 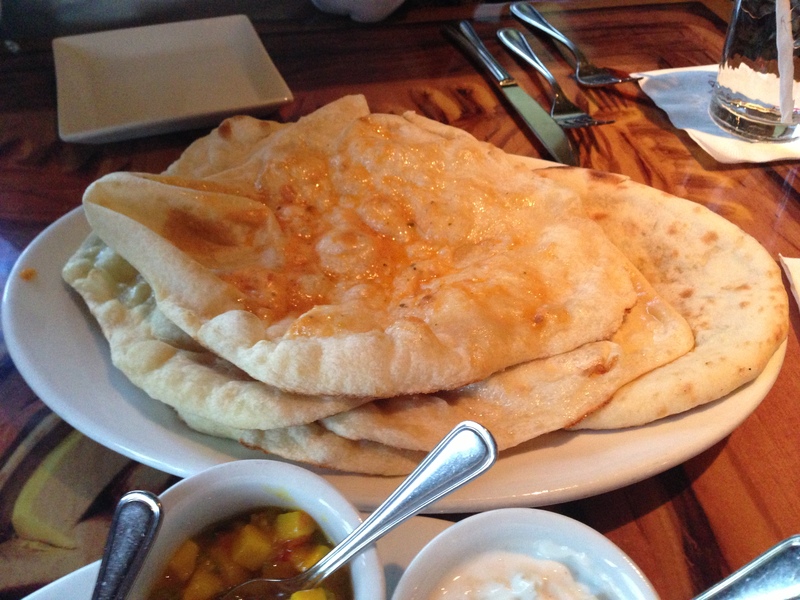 The Spicy Naan had a distinct flavor and went very well with the fantastic flavor-burst of the Jalapeno-Lime Pickle. The Cucumber Raita had a nice cooling effect – that countered the modest heat of the jalapeno – but it lacked a little flavor. 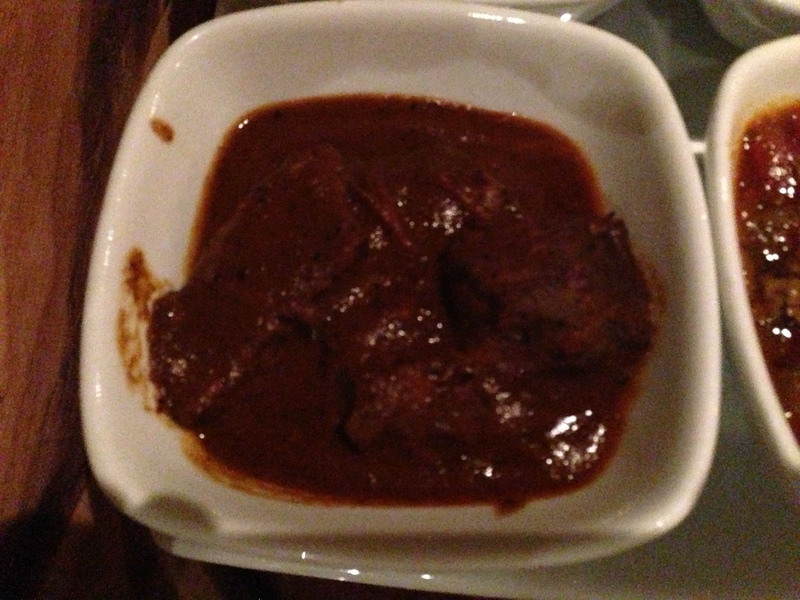 The Mango Chutney was a bit too sweet for us. As for the hummus, we prefer the version we get at Publix. Sorry, Sanaa, but Publix sells some great red pepper hummus! After the bread, we moved on to appetizers – where we chose the Spicy Garlic Shrimp (with cauliflower) and Lamb Kefta Kabobs (with mint chutney). The Spicy Shrimp was good, but the Lamb Kefta Kabobs were phenomenal. 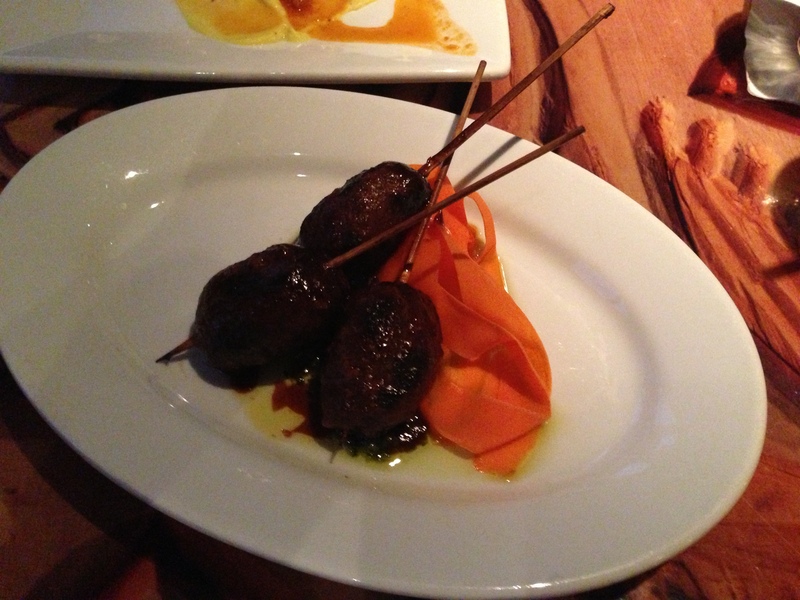 Basically, they are spiced lamb meatballs, but they were very flavorful and packed a pleasant tinge of spiciness. In fact, these were so outstanding that when Mrs. All in WDW and I went back for lunch a few weeks later we each ordered our own plate. 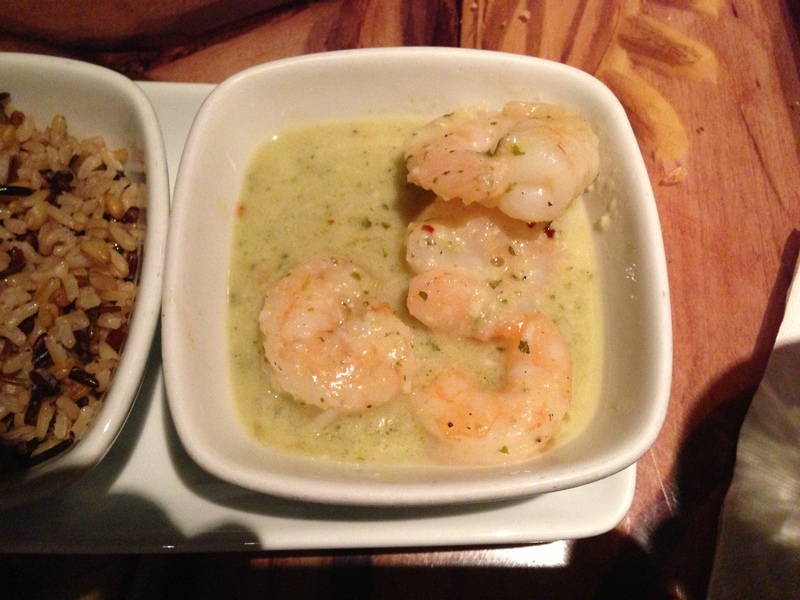 I’ll go a step further … the next time we go back, I’d be very tempted to have them for my appetizer and my entree! Yum. So, the entrees have a little bit of a back-story … and I’m not talking about the fact that I never got around to writing my entree-focused ‘advanced scouting report’. Prior to our visit, I had my mind set on ordering Sanaa’s Tandoori Chicken. We were staying in Jambo House, and we took their shuttle van over to Kidani for dinner. On the way over, I asked the driver what he recommended by way of meals, and he just raved and raved about the Butter Chicken. Really? It hadn’t even hit my radar! Well, it was a good thing I listened to him because that dish was out of this world! 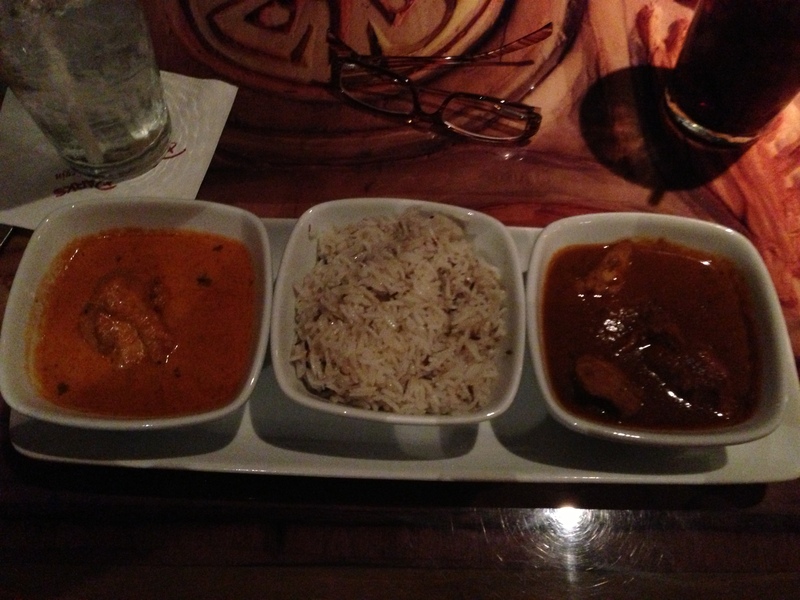 I had the Butter Chicken and the Spicy Durban Chicken. 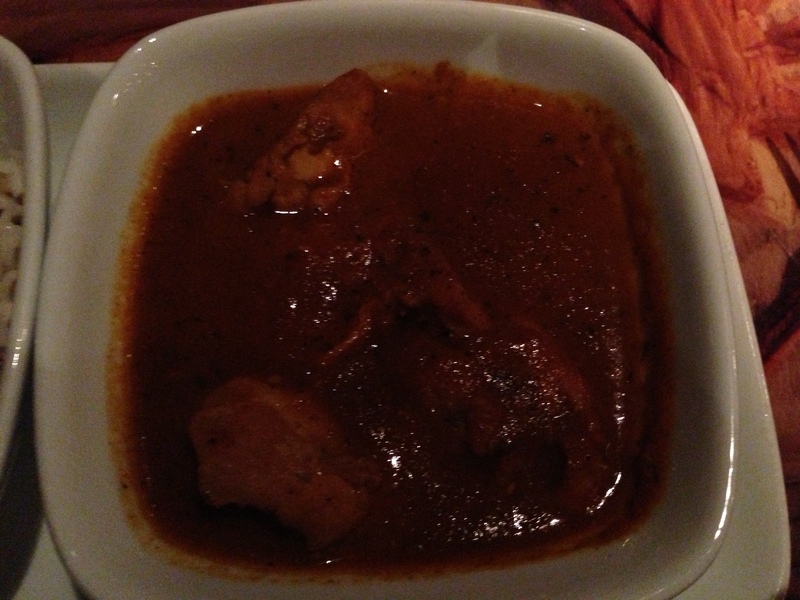 The Butter Chicken was creamy, luxurious, delicious, and lived up to our driver’s hype. The Spicy Durban Chicken paled in comparison. 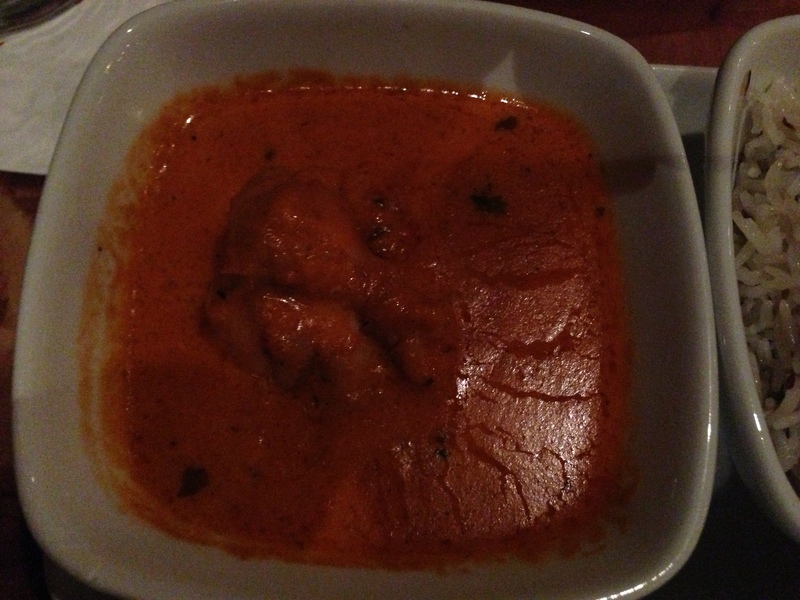 The next time we went back to Sanaa, I’m not ashamed to admit that I ordered two portions of that delectable Butter Chicken – leaving all of the other entrees completely out of consideration. 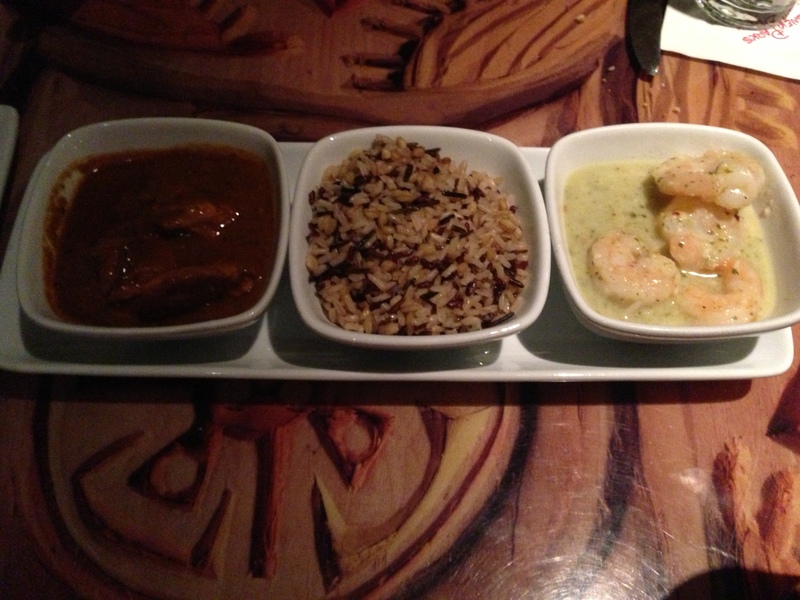 Mrs. All in WDW had the Spicy Durban Chicken and the Shrimp with Green Curry Sauce. Although the Green Shrimp was tasty, she preferred the Durban Chicken … and when our lunch several weeks later came around, she, like me, also took on a double-dose of Butter Chicken. 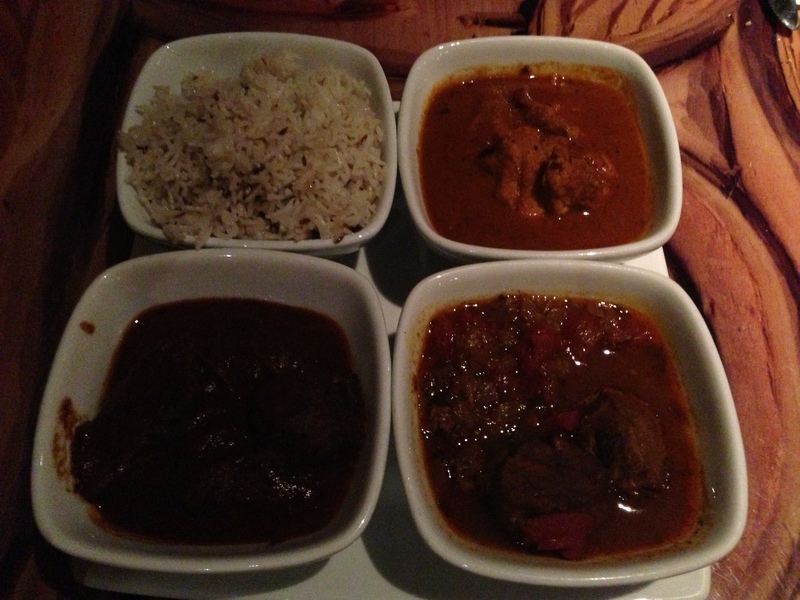 Finally, our son tried three of the entree options – the Spicy Durban Chicken, the Lamb Vindaloo, and the Beef Short Ribs. The Beef Short Ribs ended up being his favorite of the three. I have to admit, as we approached this particular trip to The World, we were a bit skeptical about making our first visit to Sanaa. “African Cooking with Indian Flavors” isn’t necessarily on our typical list of target cuisines, but clearly that was only because we had never visited Sanaa. Our experience was fantastic, and, as I’ve already mentioned several times, we’ve gone back again. My advice to you? Go to Sanaa. You won’t regret it at all! No dessert? Your meals looked yummy enough to fill you up, but any dessert thoughts? No dessert for us, sorry. We’re not big fans of dessert, to be honest, and, yes, the bread, apps, and entrees had us stuffed! We’re more into savory than sweet, so we opted for the appetizers. It looked like a well rounded meal without it- thanks for the tips! It was outstanding. When we went back to lunch a few weeks later, it was Mrs. All in WDW’s idea, and of the bunch of us, she was most skeptical about going in the first place. She must really have liked it! Thanks for reading and visiting All in WDW! We are planning on heading here during our trip in November – I was on the fence about booking this reservation, but this post sealed the deal!! Butter chicken is one of my favorites, so I’m really excited to try Sanaa’s version! Outstanding! Don’t forget to come back and let us know how you liked it, OK? Oh how I love Sanaa.. we stayed at Kidani 2 weeks ago and spent alot of time in the Sanaa Lounge (was an elevator ride down for us our room was next to the elevator.. lol) and that is another hidden gem there at Kidani..while not big it has a decent beer menu and a great wine menu and also you can get bread service there and some other foods.. the lamb sliders looked and smelled amazing! The bread service, the lamb, it’s ALL outstanding! We like that lounge too!